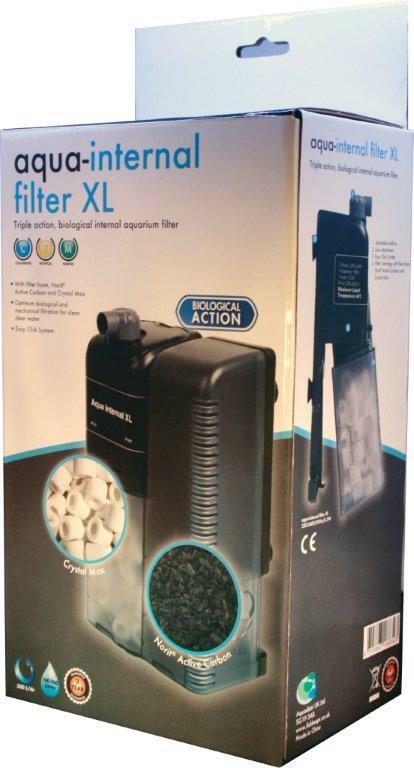 The Aqua-Internal XL Bio Filter is suitable of filtering from 100 to 200 litres of aquarium water. This model is an efficient and quiet dual action internal aquarium filter. The compact Aqua-Internal XL filter is ideal for use in all types of coldwater and tropical aquariums. The ‘extra-large’ dual action filter cartridges, contained within the filter, consist of the 3 forms of filtration: mechanical, biological and chemical. The fully open structure filter foam provides optimal mechanical filtration and creates a vast bacterial growth area. The chemical filtration section of the cartridge includes Norit ® active carbon to remove organic contamination, chemicals and dyes from the water. For more information on this filter and accessories, or anything else aquatic, then please speak to a member of staff at your local Maidenhead Aquatics store.